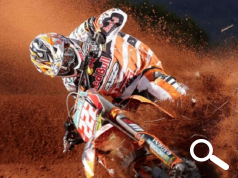 Industry high flyers KTM, riding high on a wave of recent new model launches, have announced that they have joined the fight against crime and taken the step to protect their off road customers by signing up to the MASTER Security Scheme. KTM will fit all off road models in their range, including children's bikes, as standard from June 1st*. Theft is a major concern for the off road sector and accounts for a significant proportion of the 26,000 machines being stolen each year, many of which are never recovered. To help tackle the problem the Industry came together in 2012 to launch the Official MASTER Security Scheme, the first ever official industry wide security marking scheme. The scheme uses state of the art Datatag marking technology and was developed in close collaboration with the Police, Home Office and ACPO. The benefit of the scheme means that, as all parts are readily identifiable, criminals cannot break bikes down into component parts to rebuild and sell on. Backed by KTM and other major motorcycle manufacturers, the Police and the Home Office, the scheme will, according to the Metropolitan Police Stolen Vehicle Squad, have a dramatic effect on theft of new machines, 'With the launch of the MASTER scheme new bikes are protected before even leaving the showrooms – this is a huge step towards defeating the criminal gangs.' Commented D.C. Simon Ashton of the Metropolitan Police. KTM join a growing number of the industry's top brands who, together with the industry, are doing something to end the effect of theft on Britain's bikers for good. *machines supplied from June 1 to June 30 will be supplied kits to be fitted after delivery. **not included in Off Road Kits. Existing KTM owner and owners of road going machines are at greater risk of theft than before as new machines come ready protected by the MASTER Scheme. However they can protect themselves by retro-fitting a Datatag Motorcycle Security Kit. 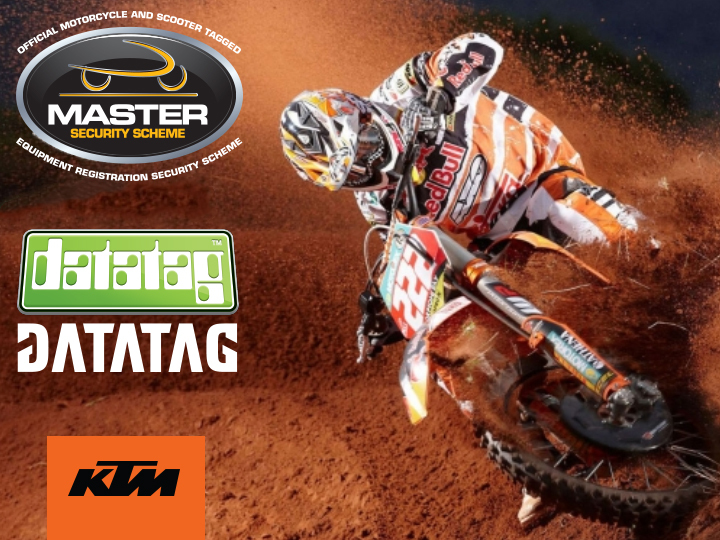 With a retail selling price of just £89.99 and available through their local KTM dealers, Datatag's new marking kits offer protection from theft and peace of mind for owners across the UK. Why is security marking necessary? 50 % of these are stolen from Greater London, with 35 machines taken from its streets each day. 43% of all insurance total loss pay outs are due to theft (according to MCI research). *(Facts and figures supplied by the Motorcycle Crime Reduction Group). The MASTER Security Scheme system has Home Office and ACPO accreditation under the Secured by Design scheme and complies with several other quality accreditations including ISO and LPS (Loss Protection Standards) for its secure database. Early adopting members of the scheme are Honda, Triumph, Suzuki, Kawasaki, BMW, Yamaha, Zing, Zero and Ducati. There are no annual fees when fitting the MASTER Security Scheme. When a MASTER Security Scheme marked motorcycle is ultimately sold on, the scheme registration can be transferred to the new owner. (A small admin fee applies to transfer requests). Information is stored on Datatag's secure database - accessible 24/7 and is both Home Office and ACPO Police Secure accredited. Datatag technologies have been approved by Thatcham under their strict new TQA scheme. Datatag offer aftermarket security marking kits for all machines, with specific scooter and motorcycle kits available to all second hand machine buyers. There are no annual fees when fitting Datatag. Many insurers give discounts of between 5%-20% off an annual premium.